Scattered showers and thunderstorms. High 78F. Winds SSW at 15 to 25 mph. 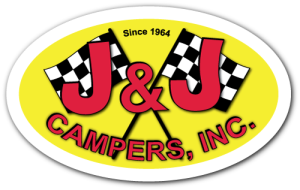 Chance of rain 60%..
At J & J Camper Sales we treat our customers like friends. Our dedicated, knowledgeable sales and service staff will make you feel at home. With our experiences staff, we feel that we can meet and exceed any of your camping needs.